This week, MACC has lodged their application with the UK Department for Transport to be the location of the first UK Spaceport. Following the announcement earlier this year of eight potential locations within the UK that could host such a facility, MACC have been working closely with Argyll & Bute Council and Highlands & Islands Enterprise to put together a proposal that states why the former RAF Machrihanish is the best candidate in the British space race. Six of the eight shortlisted locations are in Scotland; Macrihanish Airbase, Stornoway Airport, RAF Leuchars, RAF Lossiemouth, Kinloss Barracks and Prestwick Airport. Machrihanish has a distinct advantage as the 3,049m runway is the only one on the shortlist that meets the criteria of 3,000m, therefore would not require upgrading. The coastal location and lack of highly populated areas roundabout the site also make it a huge contender. However, all locations have their ‘unique selling points’, with candidates down south also putting forward a strong case. 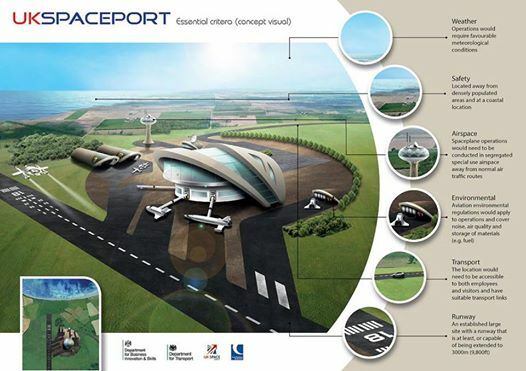 In the past few months, a number of websites have emerged, including www.spaceportcornwall.com and www.spaceportscotland.org which present a vision of what a future UK Spaceport could look like. Local councillors have offered their support to MACC and Member of Parliament for Argyll and Bute, Alan Reid paid a visit to the site in September to hear of plans to put forward a bid. We now await feedback on the Department of Transport’s consultation process, which closed on Monday 6th October, 2014. It is expected that a further shortlist will be announced and a final decision on the location will be made in April 2015.